Since I've had several "how did you make those?" requests, I decided to post simple directions here on the blog and add the link to my list of tutorials. Really, this couldn't be easier. The biggest trick is to have beads with large enough holes to accomodate the crochet thread, and to have a variety of fibers sitting about. Here's how mine was made. String all of your beads onto the crochet thread, remembering to place the biggest ones in the middle of the batch. Chain about 100 stitches. Don't worry about whether it's enough ~ if you come to the end before finishing your necklace, you can always add more. If there are too many, you can just remove some. Start double or single crocheting along the chain, depending upon how thick you want the stand. Add your beads a semi-regular intervals. When you get to the end, chain some more to form a closing loop. Crochet back along the entire length with single crochet to reinforce the strand. At the other end, chain some more, and crochet back along that strand until you meet up with the already-reinforced part. Add a bead or button closure to the end of this chain. Really simple now! Don't make it too complicated. 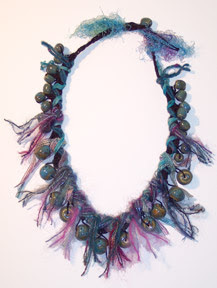 Take strands of interesting fibers, and wrap them along the length of the beaded strand. I kept most of mine doubled. Knot them at both ends, with tails hanging down. Repeat with additional fibers, making sure that you wrap in slightly different patterns, and/or end in different spots. When you've wrapped all that you want, look to see where additional fringes of fibers are needed. Cut short doubled lengths and knot them on, using the crochet hook to slip them in place underneath other fibers. If anything does not stay wrapped to your liking, you can always tack the fibers into place with a needle and thread. 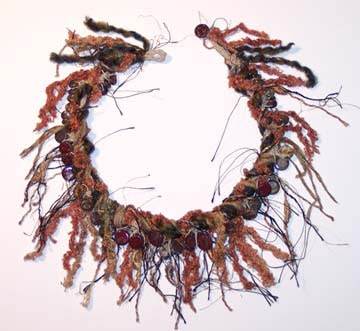 This piece ended up using three different major techniques: bead embroidery, freeform peyote stitch, and complex interwoven stringing. In addition, I had to make the lampwork glass beads in various shades of amber, brown, and purple before it could be completed. I'm pretty psyched with the way it turned out! Just one more embroidered piece to make, and I'll be able to start weaving the sections together, probably using free-form peyote stitch! My friend Anne asked me to take apart her old clip-on button style earrings and remake them into a new set of dangle earrings and a bracelet. She has a really tiny delicate wrist, so I made it from organza ribbon.